HITSEEE Syllabus, Exam Pattern, Selection Process 2017: The applicants who have filled the application form they all are now searching for the exam syllabus for start study. Here in this article applicants can see the HITSEEE Syllabus/ Exam Pattern 2017. The Hindustan Institute of Technology and Science Engineering Entrance Exam (HITSEEE) is conducted by the Hindustan Institute of Technology and Science for undergraduate applicants admission. This examination is university level exam for various engineering course. Applicants need to pass the Engineering Entrance Examination to get admission for various engineering programs. Here in this article applicants also get the HITS Engineering Entrance Exam Pattern 2017 and Selection Process of HITSEEE 2017. The applicants who are interested and eligible for this entrance examination they can refer this syllabus to start a study. The question will ask from the Mathematics, Physics and Chemistry subjects. The questions will be asked from 12th class board exam level. Following are the HITS Engineering Entrance Exam Syllabus which is provided in detail, below. Students can get here the exam paper pattern which will help to applicants to understand the entrance examination. With the help of Exam Pattern of HITSEEE 2017 applicants get to know the wattage of each subject. Following are the examination paper pattern applicants can refer this before an examination. HITSEEE 2017 is an objective type multiple choice question. The applicants who given this examination they all are select on the basis of their performance in engineering entrance examination. Only the cut off applicants is call out for the admission process. So applicants who wish to get admission they have to clear the HITSEEE 2017 Selection Process. The result will be announced on the official website after the entrance examination. 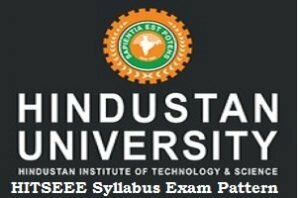 Candidates can get all the latest information of HITSEEE Syllabus 2017 and Exam Pattern in this article. With the help of syllabus and exam pattern applicants can score high marks entrance examination. And to get admission all the applicants need to clear the selection process for the admission. Any applicants who have a type of inquiries they can post their question in a comment we will give our response as soon as possible.